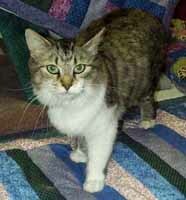 I brought Chelsea (formerly Flora) home on July 24, 2002. She's doing great! She spent a lot of the time hiding under my bed for the first couple of days, but now she barely goes under there. She loves sitting on the window ledge and looking out the window and playing with her toys . She doesn't care too much to sit on my lap, but loves to jump on the couch to lay down beside me. She even likes her belly scratched now! a "no-kill" policy. You provide a wonderful service!